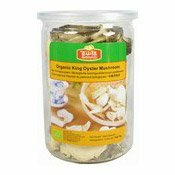 Directions: King Oyster Mushrooms are ideal for vegetarian stir fried or salads. Simply soak in hot water for 15-20 minutes before adding to the dish of your choice. This product may naturally contain sulphite. Ingredients: Dried King Oyster Mushrooms (Pleurotus Eryngii) (100%). Simply enter your details below and we will send you an e-mail when “Organic King Oyster Mushroom (Dried) (杏鮑菇)” is back in stock!